Chinese Ambassador to Fiji Zhang Ping says in China they have a proverb. It says it is better to help others with the way of fishing rather than giving them the fish. He is talking about the rationale they are using to fund community aid projects. These are small pilot projects with the potential to grow into big commercial ventures. Those who run them must have scientific knowledge and management skills to keep the business ventures growing. It means being prudent, reinvesting part of the profit to keep the business expanding. He was stressing the need to be professional in order to achieve success. He shares the same vision as the Minister for Youth and Sports Laisenia Tuitubou who has travelled extensively in the four divisions to encourage young people in the rural areas to be trained and become entrepreneurs. 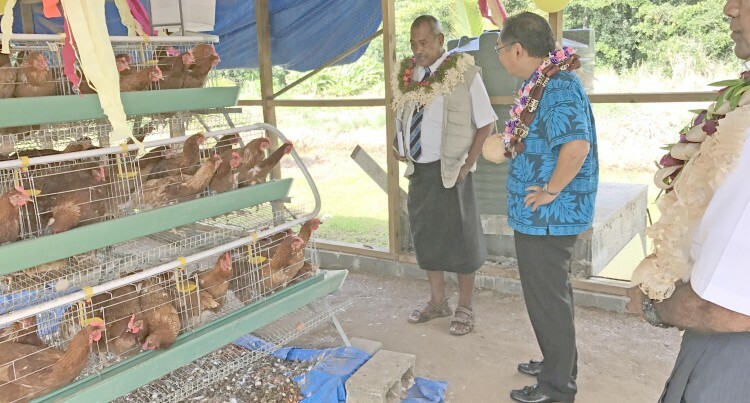 At Taci, Noco, Rewa, yesterday, a Chinese Embassy-funded poultry farm was handed over to the Taci villagers by Mr Ping. Mr Tuitubou received it on behalf of the villagers. The message to the villagers could not have been clearer. When it becomes fully operational the poultry farm could be earning $1000 a month at the start. As the farm expands through reinvestment, the earnings will continue to grow. Iowane Soko, the ministry’s Divisional Manager Central Division, said the youths who would be involved in the project had received some training at the technical college in Nausori. The project will give them practical experience and capacity building. As the business grows, they are required to grow with it. From here some of them may want to start their own business in a new line of products. The experience gained by their involvement in this project is invaluable. This is the first community aid project by the Chinese Embassy. $10,000 had been spent in setting up the poultry farm. It’s a pilot project and the Chinese want to see it succeed. If it succeeds, the Chinese are prepared to give more assistance. The Taci project can be replicated in other rural areas. During Tropical Cyclone Winston, Taci was flooded despite a seawall. Tidal waves pushed sea water over the seawall into the village. They know that event was part of the climate change phenomenon. So they are looking at how they could mitigate a recurrence of that Winston event. Because of their susceptibility to flooding, they would be looking at an evacuation centre that is elevated by piles away from the reach of floodwaters. That would mean finding the funds to build a centre. The poultry farm would start their fundraising drive nicely if they manage it well. Mr Tuitubou’s vision is that income-generating projects will empower the youths as they become active participants in economic development. In turn this will reverse the urban drift and stimulate the rural economy which contributes significantly to the national economy. The collaboration between the Ministry of Youth and Sports and the Chinese Embassy is showing positive outcomes. It has provided an essential lifeline for young people who would otherwise have little hope for the future.